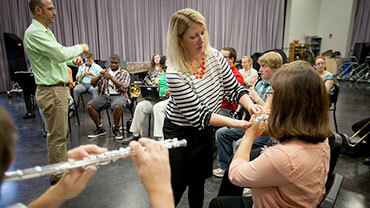 Dr. Rebecca Johnson, a flute instructor in EIU's Department of Music, reflects on how studying music at Eastern can effectively prepare students for all facets of life. The Department of Music at Eastern Illinois University is dedicated to helping students achieve their musical and educational goals. An innovative curriculum, exceptional facilities, and dedicated faculty combine to produce outstanding teachers and performers throughout the United States and abroad. The Department of Music offers varied and quality music experiences to our students. Music students at EIU perform regularly throughout the academic year in large and small ensembles, both on and off-campus. The music faculty at EIU are drawn from some of the finest performance and academic environments in the world, and most hold advanced degrees in their discipline. The Department boasts a young, motivated and caring faculty who work together daily to ensure our students' progress through the program. EIU’s music curriculum centers on performance and music education; however, as a growing department, a Bachelor of Arts in Music and a new online MA in Music, Music Education concentration have recently been added. We also offer minors in music and jazz studies for students who wish to participate in music while pursuing a major outside of the department. 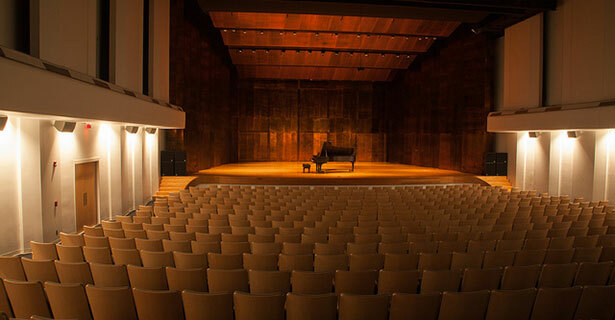 The newly renovated Doudna Fine Arts Center was unveiled to the EIU campus in 2008 and features a 568-seat concert hall with a copper-clad stage shell and professionally-tuned acoustics. In fact, the Department boasts four top-notch performance spaces including a 175-seat recital hall lined with opaque glass, a stadium-seating theatre, and a black box theatre. All of the Department's performance and large rehearsal spaces are wired for recording from the basement Recording Studio, the finest of its kind in Illinois. EIU music students have access to Wenger practice modules, smart-enabled classrooms and WiFi access throughout the building. For more on our world-clas facilities click here. All Teacher Licensure concentrations share the same Music Core and Professional Course sequence as offered through the College of Education and Professional Studies. All concentrations lead to the same licensure, with broad-based preparation in all areas of music education. However, each of the following concentrations has unique professional development experiences, designed to help the prospective teacher achieve his/her professional and musical goals. Click here for more information on this program. The Music Performance degree is designed to provide students the opportunity to develop all necessary skills for success in the music profession or to pursue advanced degrees in music performance. Click here for more information on this program. Composition students receive one-on-one instruction in composition and on their primary instrument. Recitals for students in the composition concentration feature a combination of studio repertoire and original compositions. Click here for more information on this program. For students interested in pursuing a degree in jazz, Jazz Studies is available as a concentration within the Bachelor of Music degree. This concentration offers students a comprehensive study of jazz music from academic and performance perspectives. It is well-known for its high quality instruction and successful graduates. Click here for more information on this program. The Bachelor of Arts in Music degree provides the study of music within the context of a liberal arts framework. The music content allows students to develop their musicianship skills, while the program grants the flexibility to choose elective courses within an area of interest either within the Department of Music or in another field of study. Click here for more information on this program. The Music Departmental Honors Program provides the opportunity for students to delve more deeply and independently into their studies. Students creatively research, explore, investigate and analyze various aspects of music at an advanced level while completing their core curriculum requirements in Music. Click here for more information on departmental honors. Percussionist Jamie V. Ryan thrives on playing and teaching many types of music. He performs regularly with the Wisconsin Chamber Orchestra. An active solo and chamber musician, Jamie is a member of the Galaxy Percussion Group, with Michael Udow, Anthony DiSanza, and Roger Braun, which toured South Korea and the United States in 2010 and 2011, respectively. Paul Johnston has enjoyed teaching at Eastern since 2004. He directs the Jazz Lab Band, coordinates the combo program, and teaches courses in jazz piano, improvisation, and arranging. Paul remains very active as a teacher, performer, and composer. Danelle Larson is an Assistant Professor of Music Education and Director of the Music Education Division at Eastern Illinois University. Her responsibilities include teaching courses in music education and supervising student teachers. Her research interests include the use of chamber music in instrumental music curricula, 19th and 20th century female bands, and gender research in music education. In spring of 2016, Dr. Larson was awarded the Provost’s Undergraduate Research Faculty Mentor Award in recognition of her work guiding music education students in their own research projects. "The supportive environment here at EIU gives me continuous inspiration to grow and learn with every opportunity. From attending concerts and performing in recitals, to brainstorming plans for general music lessons, my experience as a Music Education major is definitely the result of one of the best decisions I have made—to attend EIU." "Whether it be the faculty, facilities, students, or just the learning experience as a whole, excellence is the standard at Eastern Illinois University." "I sought answers and help to be the best teacher I could be, and every music faculty member was always willing to give me the assistance I needed to be successful. I had a strong desire to be successful, and the music faculty always gave me the opportunities I wanted to grow and be a better teacher."